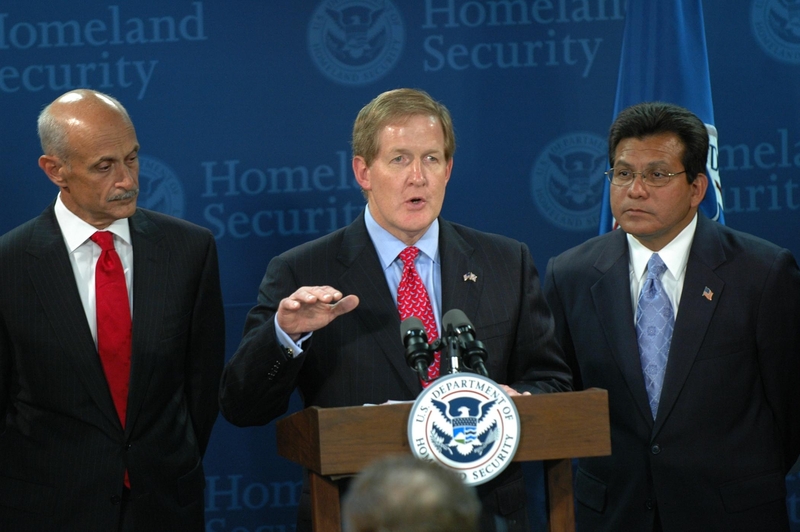 Kip Hawley, flanked by former Department of Homeland Security chief Michael Chertoff (l) and former U.S. Attorney General Alberto Gonzales, served as head of the TSA from 2005 to 2009. The introduction of invasive pat-downs at security checkpoints exacerbated that so-called disconnect, said Hawley, who co-authored the book Permanent Emergency: Inside the TSA and the Fight for the Future of American Security. “In the book, we released classified information that showed why we did what we did,” he said. The old privately run registered-traveler program became a big issue during Hawley’s tenure, when he warned that the effort wouldn’t work because of “the effects of the so-called clean-skin terrorists” not known to the authorities and absent obvious risk factors. Hawley lauded the TSA for creating the PreCheck registered-traveler program, however. “Now the TSA can look at passenger manifests in advance and put that information on boarding passes with what it knows about passengers. It’s a big step forward.” However, he advocates expanding the program to include all passengers, not just frequent travelers. “I understand the appeal to attract frequent fliers and get them in the system first, but from a risk perspective I’m not sure it holds,” he concluded.